Can Helena survive long enough to solve the mystery? 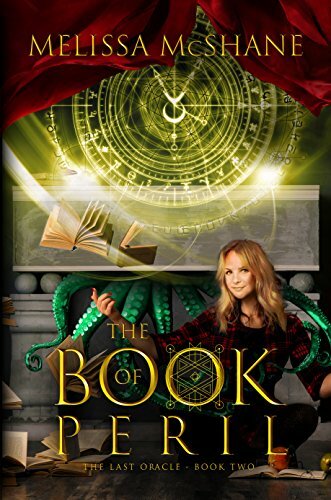 The Book of Peril (The Last Oracle #2) is a fantastical twisty sequel to The Book of Secrets! Helena’s stuck in a steep learning curve as she struggles her way through the custodian’s instruction manual, but she’s winging it, learning more about how the oracle works as she goes. Now Helena must contend with the oracle giving out duplicate and unasked-for auguries, origami-wielding bad guys, a stalker ex-boyfriend, an attractive ex-Navy SEAL, a potentially traitorous frenemy, and yet more fashion advice from her BFF, Viv. While Helena can see through the most complex illusion, can she see through to the truth? Who is trying to fool the Oracle and why? Can she survive long enough to solve the mystery? In The Book of Peril we learn more about the Neutralities, the magical world as a whole, and Helena visits the spiritual successor to the Library of Alexandria, the Athenaeum, searching for clues in past custodian’s reports of strange behavior on the part of the oracle and on the magic required to cast such powerful illusions. Helena must fight to protect the oracle and to clear Judy, who is jailed as the prime suspect. Overall, this is an action-laced book with plenty to enjoy, from complex magical systems, strong female characters, believable world-building, and a mesmerizing story. One caveat: There’s a potentially triggering scene involving physical violence against a woman; so if you are triggered by that, you’ll want to skip over that particular confrontation, but you should see it coming when you get there. This is a great addition to The Last Oracle storyline, and I’m only sorry that I have to wait for the next book. Highly recommended.